The blue coat | Cosa Mi Metto??? I like so much this blue coat, its design is so elegant and its color is so shiny and I think it makes the whole outfit! 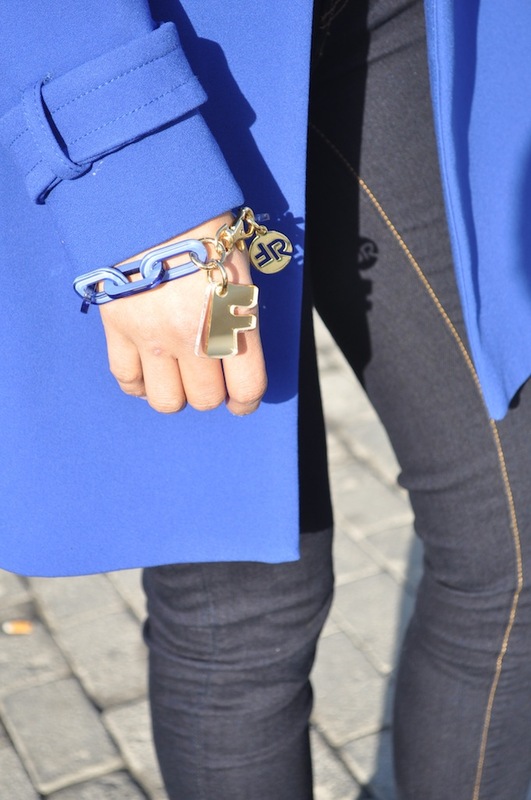 Wearing this shade of blue, I took the opportunity to wear this amazing bracelet with an "F" pendent that my friend Giuliano and Paola gave to me for my birthday! Tell me all your opinions about my look! Mi piace molto questo cappotto blu, il suo design è così elegante e il suo colore così brillante e penso che faccia l'intero outfit! Indossando questa tonalità di blu, ho colto l'opportunità per indossare questo fantastico bracciale con un ciondolo a forma di "F" che Giuliano e Paola mi hanno regalato per il mio compleanno! Ditemi tutte le vostre opinioni sul mio look! U look so elegant n chic !!! che bello e poi hai trovato lo stesso identico colore per cappotto e scarpe! This color looks great on you! Love your coat and your shoes. Il cappotto è bellissimo ma le calze di quel colore non mi piacciono proprio!!! Love your blue coat and your blue high heels - so wonderful... congratulations! And what a beautiful blue .. and coat :) The bracelet is lovely . You look great...love you shoes! the coat and the bag are so pretty! Gorgeous! I love everything about it, esp the bag! You are gorgeous as always!! !Nice outfit!! I love the Klein blue! Que bonito el abrigo azul, me gusta. Love the color of the coat! Love the blue shoes with the blue jacket. Stunning, and the perfect pop of color! That blue color is beautiful! Gorgeous! So classic and chic. great coat! I also want this! beautiful views! Bello il cappotto adoro il blu elettrico!!! what a stunning coat! I love the whole outfit. You look gorgeous! I love your look! The matching coat and shoes look great! very cute and adorable - Love the shoes. Those shoes rock! Cool coat, too! That coat truly is amazing. I love that your shoes match as well! That is one of my favourite colours! Love the blue coat and the matching shoes!!! cute outfit and love the blue jacket! Lovely outfit. This blue coat looks adorable. I love this shade of blue! oh i love ur shoes! YOUR COAT AND SHOES ARE TO DIE FOR! Ah, I want the coat so badly. Hopefully I'll check my Zara to see if they have them. Love that color! It looks great on you! You look stunning in blue, so chic. Awesome coat, love the color! i like the colour of that coat! stai davvero benissimo mi piace il blu su di te! ti va di fare un giro a Montecarlo? You look so lovely in that blue coat, I love the colour!! I love the blue coat combined to these great shoes. Carinissima come sempre :) belli gli orecchini! Precioso abrigo y precioso look!! I love the blue coat! It is pretty! Your whole outfit looks so chic and comfy! From a distance, your jeans looked black, but I love the last pic of you, I see all the blue and white. I love it. Matches my hair! @Kaca Kabele Hadravova:Thank you for your wonderful idea, I’ll do it! Amo tutte le vostre parole! I like that the coat and the shoes fits perfectly together. love it! you look very chic! oh gosh this is probably the most gorgous coat i´ve ever seen darling! i love it´s electric blue colour! My favorite color is blue. You look amazing :) Thanck you for the comment! I'll follow you, follow me back if you like me :). Gorgeous coat!! Any chance you will be putting it for sale?